Score More Points – With Less! Whether you’re following the “madness“ of college hoops or need some simple snack ideas, shoot for recipes with fewer ingredients to save you time and money. Frozen ingredients can be used creatively to make delicious finger foods. I guarantee you’ll score big with these easy, dunk-able snacks. 1.Prepare cheese tortellini according to package directions. Drain and rinse under cold water and set aside. 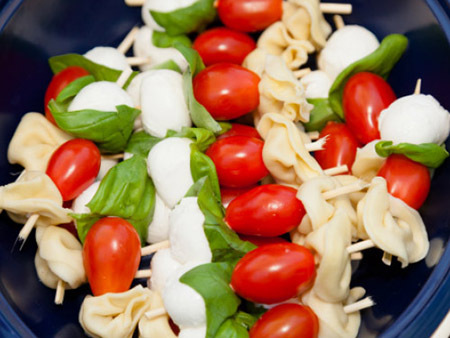 2.Thread each skewer with 1 tortellini, 1 piece of fresh mozzarella, 1 tomato and 1 basil leaf. 3.Refrigerate until ready to serve. Optional: Serve skewers with small containers of balsamic glaze and prepared pesto for use as dipping sauce or drizzle. 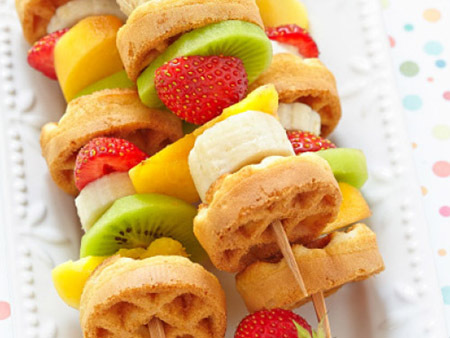 1.Thread each skewer with 1 waffle piece, 1 strawberry half, 1 piece of mango, 1 piece of pineapple and then repeat with a 2nd piece of each. 2.Optional: Serve skewers with small dishes of chocolate sauce and fruit sauce for dipping or to drizzle. Birds Eye Steamfresh Protein Blends Southwest Style per the instructions. Pour into a serving dish and stir to evenly distribute any sauces. as an alternative to a hearty salsa or “Cowboy Caviar”.